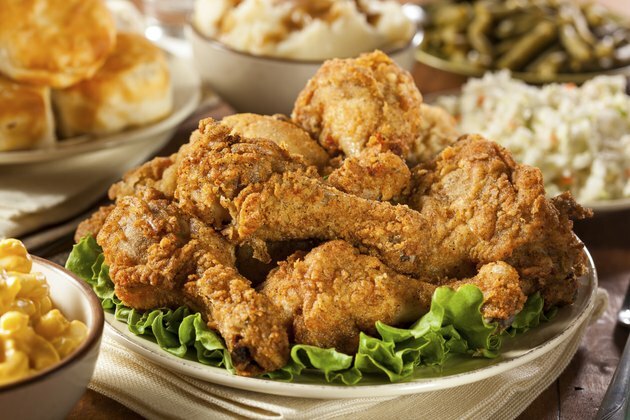 Though boiled chicken is safe to eat as long as it's cooked thoroughly, frying the chicken before you serve it will add flavor and a crunchy texture. Because the chicken is already cooked, it's a fast process to fry it, making it easy to get a quick meal on the table. It also ensures that the chicken is cooked all the way through. Serve it with nutritious side dishes, such as baked potatoes or steamed squash, and you'll have a tasty meal in a short amount of time. Pour cooking oil into a deep skillet or an electric skillet. Turn the heat to medium high and heat the oil to 375 degrees Fahrenheit. Dump a cup or two of flour onto a plate. Add dried herbs and seasonings, such as black pepper, onion powder or paprika. Plan on about 1 cup of flour for 4 boneless chicken breasts. While the oil is heating, stir the flour and seasonings with a fork until everything is well blended. Crack 2 or 3 eggs onto a separate plate for every 4 boneless chicken breasts. Gently beat the eggs with a fork. Pick up a piece of boiled chicken using a pair of tongs and dip it in the beaten eggs until it's well coated on all sides. Roll the egg-coated chicken breast in the flour mixture until it's evenly coated on all sides. Transfer the battered chicken to the hot oil using a pair of tongs. Do this so that your hand and arm are farther away from the hot oil, which can splatter as you add the chicken. Repeat the battering process with the remaining pieces of boiled chicken, adding them to the hot oil as you go. Cover the skillet and allow the chicken to cook for 3 or 4 minutes, or until the battered coating has become crisp and turned golden brown. Flip each piece of chicken using a pair of tongs. Cover the skillet and cook for 2 to 3 more minutes, or until the second side is crisp and golden brown. Since the chicken is already boiled, you don't need to worry about cooking it all the way through. Remove the chicken from the skillet using a pair of tongs. Drain the chicken on paper towels before serving it. This soaks up a bit of the cooking oil, which reduces the overall fat content of the fried chicken. Keep your oil at 375 F during the entire cooking process, recommends Rick Browne, author of "The Ultimate Guide to Frying: How to Fry Just About Anything." This ensures that the oil doesn't soak into the chicken, thus cutting down on the amount of grease in the finished product. Use boneless, skinless chicken breasts to boil and fry. These are lower in fat than chicken with the skin still attached. Use whole-wheat flour for the batter and you'll increase the fiber content of your meal a small amount. Replace the flour with bread crumbs for a slightly different taste and texture. Use a separate pair of tongs to remove the chicken from the pan. The tongs that you used to batter and flip the chicken can be contaminated with raw chicken juices, which can cause food-borne illness if transferred to the cooked meat and consumed. Don't add salt to the batter, Browne cautions, because it brings moisture to the surface of the food, which can cause the oil to pop when the food is placed in the skillet. Can You Fry Chicken in Vegetable Oil?